Accessible parking bays are available in the Function Centre’s main car park, and are located close to the front entrance. 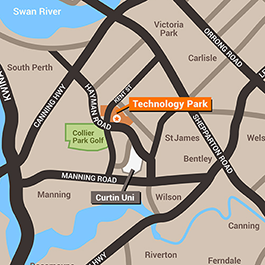 When visiting Technology Park Tenants, it is essential to liaise with the business tenant you are visiting to reserve appropriate parking space. Corner of Kent St and Hayman Road, Bentley.